Just as it casts its shadow over the rest of the world, inequality also remains one of the most serious issues now facing Singapore - with one difference. Here the Government wants to tackle it early and believes that the best chance of addressing it is during a child's pre-school years, said Law and Home Affairs Minister K. Shanmugam yesterday. The idea is to give every child a good start and the chance to succeed right from the beginning, he said. That is why the Government is levelling the playing field by providing more assistance to those in danger of being left behind during the pre-school years. It will double spending on the pre-school sector to $1.7 billion by 2022 and open 40,000 more childcare places by then, said Mr Shanmugam. Explaining the rationale behind this approach, he said that while Singapore remains wedded to meritocracy, children have different starting points in life. "At the point of birth, there is already a gap. That gap widens because of the difference in the families. And inequality will manifest itself in many intangible ways," he said. "Therefore, the pre-school years are crucial - the best chance that the Government has to give our children a good start… and a decent chance to succeed in life and to close the inequality gap." Those from less privileged backgrounds have limited networks and fewer opportunities to develop their talents. The Government is now stepping in to offer these opportunities. "The focus should be on lifting up others, not penalising those who have done well," said Mr Shanmugam. 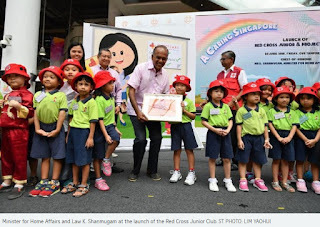 He was speaking at Our Tampines Hub at the launch of the Red Cross Junior club, a programme by the Singapore Red Cross and early childhood education specialist Kidz Meadow, which teaches five-to six-year-olds first aid skills. He used the occasion to stress that it was from early childhood onwards that inequality, an issue looming globally, needed to be tackled. The challenge here is even greater. He said that in a small country like Singapore, the richest live in bungalows while the poorest dwell in rental flats no more than 15 minutes away, a situation where inequality can be seen by all. "Inequality that grows unchecked will impact social cohesion in the long run." Globally, the divide between the elite and those left behind has already had serious fallout. Voters in the United States Rust Belt, where people lost jobs to cheaper centres overseas, vented their anger by sweeping President Donald Trump to power. In Britain, one of the most unequal of all developed countries, the poorest households also turned their backs on globalisation by embracing Brexit and voting to leave the European Union. In Singapore, the leadership has always been aware of the dangers of inequality in a small economy vulnerable to globalisation, said Mr Shanmugam. If people are denied opportunities by an entrenched majority, the society will fracture, he said. He stressed that the Government has always aimed to help Singapore's disadvantaged progress upwards, through programmes such as education bursaries and healthcare and housing subsidies. Singaporeans, too, had kept their trust in the Government for the past 50 years, but this cannot be taken for granted. "(There is) no room for complacency - trust has to be continually earned. And it can easily be lost." The next step was to go upstream and address the issue at the pre-school level. "We need to believe that meritocracy actually works... It is not just a concept," said Mr Shanmugam. A record number of children are attending pre-school and more are enrolled at a younger age, as more parents and grandparents are in the workforce and aware of the benefits of pre-school. Latest figures from the Early Childhood Development Agency (ECDA) show that about 90,000 children between the ages of two and four are enrolled in pre-schools. This is up from 66,000 in 2012. Similarly, 75,000 children between the ages of five and six are in pre-schools, up from 71,000 in 2012. An ECDA spokesman said pre-school demand has grown across the age groups, especially the younger ages, with more dual-income families and working grandparents, and more recognition of the importance of early childhood development. ECDA has also reached out to children from disadvantaged families to make sure they are not left out. Since 2016, it has expanded efforts to cover children as young as three to four years old. It refers 500 to 600 new cases of children from lower-income families not enrolled in pre-schools to its partners every year. To meet the growing demand, some 50,000 new pre-school places have been created over the last five years, and the Government will add another 40,000 by 2023. 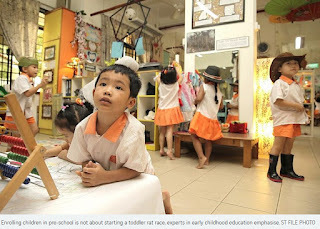 Experts in early childhood education said children do not need to wait until they turn five to be enrolled in pre-school, but they stressed that it is not about starting a toddler rat race. Associate Professor Sirene Lim, academic lead of the early childhood education programme at the Singapore University of Social Sciences, said research has shown that educating children early is not about hothousing them for Primary 1 because "that would be too narrow a foundation to create lifelong learners and citizens". Instead, such programmes must make young children feel safe and secure, build confidence in learning and communicating, foster relationships and support their curiosity, she said. Dr Joanna Tay-Lim, a lecturer from the Early Childhood and Special Needs Education Academic Group at the National Institute of Education, said placing "school stress" on children can be detrimental to their well-being. "That is why pre-school classes for children from 18 to 36 months are termed play groups," she added, emphasising that these classes integrate care with learning. Dr Khoo Kim Choo, who has been in the early childhood field for more than 30 years, said: "Over the years, training for educators working with children has improved and parents see that their kids can learn not through formal education, but through songs, stories, playing, mixing with others." For instance, children pick up languages more naturally from birth to around four years old, she added. The founder of Preschool for Multiple Intelligences also noted that physical activity - through outdoor play, music and movement - helps to stimulate brain development. "Children also acquire inter-personal and social skills in a community of children and teachers, whereas exposure might be limited if they're mostly interacting with adults at home." Ms Eugenia Yeo enrolled her son, now four, in full-day childcare at 18 months, and her daughter, now two, in infant care at 10 months. "Both my husband and I work. We have no helper and grandparents also have their own activities... Looking after two kids will also be very tiring for them," said the 32-year-old who runs her own business. "Also, the kind of activities they do in school would be quite different from what they would be doing with a maid at home." Said Ms Yeo: "They learnt to interact with peers, share things, control their emotions, become less picky with food... They learnt that the world doesn't revolve around them." Pedagogy specialist Denise Teo's 18-month-old son is also enjoying school. "He's climbing, walking, running, scooping things and getting all sorts of sensory, social and intellectual input," said the 32-year-old who also enrolled her older son, now six, in pre-school at 18 months. "At home, we talk to them in a certain way, but in school they interact with different teachers and peers, and listen to different ways of speech and more vocabulary. "The only downside is that they get sick, fall down... but I trust the teachers, and it's part of life." "I said 'never mind, I won't put them in school yet'," said the 28-year-old housewife, whose husband works odd jobs and brings home about $600 to $700 a month. A few months later, help came through Ms Sharon Eng, a counsellor from the Singapore Children's Society, who managed to find vacancies in a nearby PAP Community Foundation centre. Ms Shaodah paid just $1.60 a month for each boy to attend pre-school, after getting help from the Kindergarten Fee Assistance Scheme and Start-Up Grant, which covers school fees and uniforms, among other expenses. 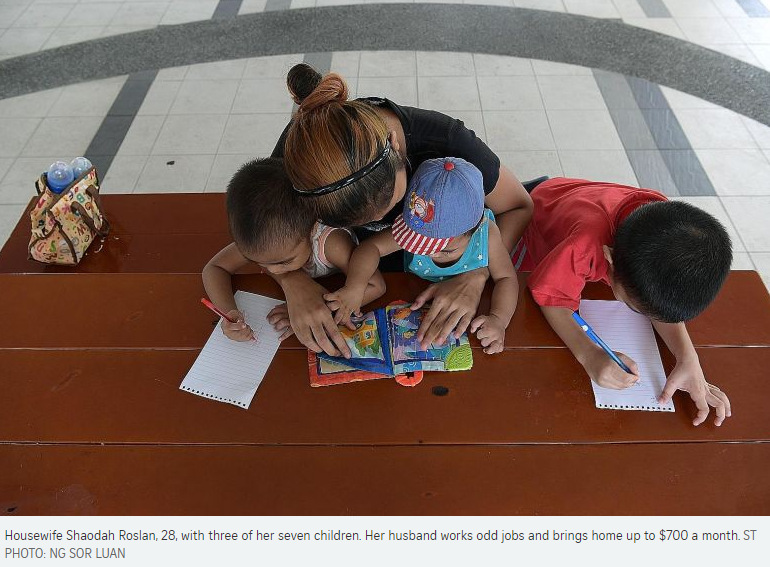 Her oldest son, now in Primary 4, attended just four months of Kindergarten 2 before going to primary school, while her second son, now in Primary 3, had more than a year of pre-school education. "Thankfully, he could catch up. Within two months, he could write his name, dates and recognise more letters," said Ms Shaodah, who has seven children in total - the youngest being seven months old. Ms Eng also helped to match three of her younger children to a nearby pre-school in 2016. "I want my kids to go to school," said Ms Shaodah, who dropped out of secondary school at 16 after being retained three times. "With more kids, we feel more love. We don't mind a noisy home," she said, though she is mindful of her family's tight budget. For instance, when her oldest son finished pre-school, she had to wait a week for her husband's salary to be in before she could pay for the graduation photograph, which cost about $20. But she is determined to make sure her children do not lag behind their peers. "Every day, I make sure they finish their homework before they play. I buy assessment books to do with my kids, for them to trace letters and learn some writing," she said. "This group of families needs special care and attention... in order to reduce the odds of unfavourable development for their children."